Julius Yego who has already attained legendary status by winning the 2014 commonwealth games gold medal and by coming within a whisker of winning an Olympic medal, further cemented his place in the pantheon of Kenya’s all time greats by winning the Javelin at the 2015 Ostrava world challenge. In the process he set a new national record. 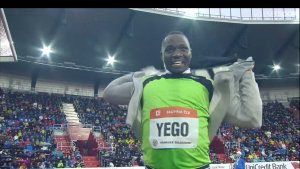 Yego was stuck in ninth place after two rounds and needed a good throw in the third round to stay in the competition. Rather than succumb to the pressure, he tossed the javelin a distance of 86.88m which was enough not just to win the event but to set a new Kenya record. Finland’s Tero Pitkamaki who has dominated this event in the past few years finished third. Yego’s toss makes him the third best African ever at this event, behind only Ihab Abdelrahman El Sayed of Egypt (89.21 m)and Marius Corbett of South Africa (88.40m) . Yego’s performance is also the 45th best all time performance in the Javelin. Its a commendable performance for Julius Yego in an event that Kenya never produces world class performers and the number of world class Africans are few and far between. This entry was posted in Kenya Athletics News and tagged 2015 IAAF Diamond League, julius yego. Bookmark the permalink.